The decision to purchase your first home is one of the biggest and best decisions you could ever make. After all, a home is the largest (and most emotional) investment most people will ever make. So, how do you know if it's the right time for you to buy your first home? There is never a wrong time to buy the right home. The key is finding a good buy and taking the time to carefully evaluate your finances. A home purchase is an important step in the path to long-term wealth. Purchasing your own home is a great investment that provides specific financial advantages, including equity buildup, value appreciation potential and tax benefits. It's also an automatic savings plan that you cannot get from renting! Here's the most important rule for keeping your stress to a minimum: you don't have to know everything. 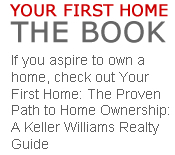 Your Keller Williams agent is ready to help you through every step of the process. When you're looking for a real estate professional to help you, know that above all else, good agents put their clients first. This is your dream, and your agent is your advocate to help you make your dream come true. Educate you about the current conditions of market. Analyze what you want and what you need in your next home. Guide you to homes that fit your criteria. Coordinate the work of other needed professionals throughout the process. Negotiate with the seller on your behalf. Check and double-check paperwork and deadlines. Solve any problems that may arise. Ultimately, your lender will pre-approve you for a certain amount, but YOU will decide what you're comfortable paying every month. Remember, your lender only sees your finances on paper. It's up to you to decide how much you're willing to stretch your budget in order to get into your dream home. Is neighborhood stability a priority? You'll learn as you look at homes, your priorities will probably adjust along the way. Once you've found a home you love, the next step is making a compelling offer. While emotions are probably in high gear once you've found a home you love, it's important to remember that a home is an investment. Your agent will research similar properties in the neighborhood to help you determine the market value, and fair price, for your home. Look to your agent to explain and guide you through the offer process. The three basic components of your purchase offer are price, terms and contingencies. Price is the dollar amount you are approved for, willing and able to pay. Terms cover the other financial and timing factors that will be included in the offer. Contingencies are clauses that let you out of the deal if the house has a problem that didn't exist or which you weren't aware of when you went under contract. They specify any event that will need to take place in order for you to fulfill the contract. Just because you love a particular property doesn't mean that it's perfect. In fact, this is where reason has to trump emotion. You'll need to have a property inspection (which we highly recommend you attend) that will expose hidden issues. This way you'll know what you are getting into before you sign closing papers. Even if your home passes inspection, you'll still need to buy a home owner's insurance policy that protects you against loss or damage to the property itself and against liability in case someone sustains an injury while on your property. Staying in control of your credit and finances. If you are tempted to make any large purchases during this time, it's best to talk to your lender first. Keeping in touch with your agent and lender, returning all phone calls and completing paperwork promptly. Communicating with your agent at least once or twice a week, and verifying with your lender that all mortgage funding steps are completed. Conducting a final walk-through of the home with your agent. Confirming with your agent, home insurance professional, and lender that you have the settlement statement, certified funds, and evidence of insurance lined up prior to closing. Congratulations, and welcome home! The home-buying process is complete, but just like any big process, there's a maintenance plan! It's now your responsibility, and in your best financial interest, to protect your investment for years to come. Performing routine maintenance on your home's systems is always more affordable than having to fix big problems later. Be sure to watch for signs of leaks, damage, and wear. And remember, just because the sale is complete, your relationship with your agent doesn't need to end! After closing, your agent can still help you - providing information for your tax returns, finding contractors and repair services, and even tracking your home's current market value. Looking for a new home can be an exciting and challenging experience. Having a real estate professional that takes the time to understand your unique needs and lifestyle is important. Our associates work hard to not only find the perfect home for you, but also to handle every last detail of the purchase process, from negotiating the terms of sale to recommending moving companies. To help you get started on buying your new home, take advantage of these valuable resources.